Why you should be an SSS member? In the Philippines, every working Filipino whether contractual or regular has the mandate to contribute to the country’s social insurance. It is strengthened in the Republic Act No. 8282 or also known as Social Security Law, that every employed individual not more than 60 years of age and who are earning monthly more than ₱1,000 is mandatory to contribute to the Philippine social insurance. It consists of three (3) bodies of programs namely, Social Security System (SSS), Home Development Mutual Fund (HDMF or the Pag-ibig Fund), and the Philippine Health Insurance Corporation (PhilHealth). So, when you’re employed it is automatically mandatory but what about for the self-employed, the Overseas Filipino Workers (OFWs) and those who are in the non-working sector (NW). Well unlike in Pag-ibig Fund and PhilHealth, membership is just optional. Talking about SSS (Social Security System), it is created for the private employees and for every Filipino family. Basically for the whole family insurance. So, the question is why you should be a member of SSS? “ You” includes those self-employed, Non-Working spouses, OFWs, “si Nanay na nasa bahay lang nag aalaga Kay bunso”, “si Ate na may sari-sari store”, “si Tatay na jeepney driver”, “si Kuya na umi extra-extra lang tambay madalas”, “pati sa mga pahinga pa ngayon hindi pa naka sampa nang barko”, individuals, etc. Let’s not be so technical here or too informative. I bet if you’re reading this now “Juan “, it is for you. Health is wealth. Yes, you can avail this OFWs and self-employed/voluntary member. Just notify the SSS if you were sick and confined and or just at home unable to work due to sickness or injury. You will avail your cash allowance equivalent to the no. of days that you were unable to work. This is for all the about-to-be mothers out there and or for those moms who still have a plan to have a baby. And or for every female member’s security when you decide to give birth in the future. A daily cash allowance is given to you for having been unable to work due to childbirth and or even miscarriage. The benefit is granted up to first four ( 4 ) deliveries or miscarriages. Yes, they have also disability benefit. A cash benefit you can avail a lump sum or monthly pension and or whether partially or totally disabled. Speaking of disability, it is when a person’s physical or mental condition limits his ability or unable to work anymore. So when you happen to retire soon and or you want a good retirement if you’re a member you can avail this. A member of at least 60 years of age, separated from employment and or unable to work due to old age. You can have your monthly pension or you will have it lump sum. Do you not want it? You will have your sick leave and plus a retirement benefit. An unexpected event that will happen to almost every Juan. The beneficiaries of the deceased member could avail a cash benefit, a monthly pension or a lump sum amount depending on the case of contributions. Certain deaths such as accident, no one is really prepared on that. As well as in all sorts of death, the family that left behind always carry the load of worries. Well, at least they have this benefit. It’s already an advantage. When death happens, there’s a funeral you somehow unprepared of the finances and expenses. The benefit is given to whoever paid for the burial expenses of the deceased member. Well what’s good now, you can avail it with at least (1) one contribution payment. Need cash? To meet your short-term needs. Yes, a member can avail a cash loan. It is granted to whether employed, self-employed or voluntary member. The loan amount depends on your monthly salary credit contribution. And a qualifying member should have at least 24 months of contribution. 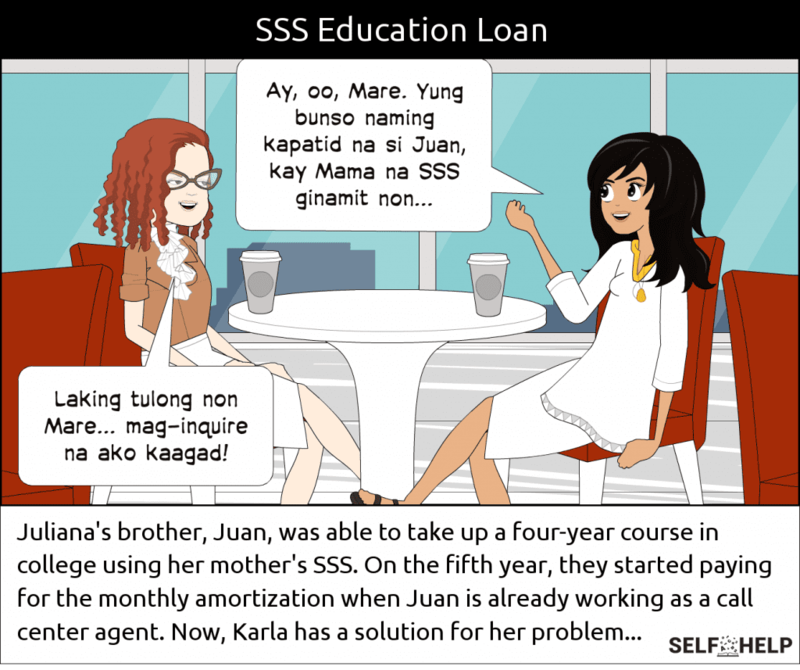 SSS uses diminishing interest for as low as 10% per year. So, after availing your maternity, your Anak (child) now is taking college soon. 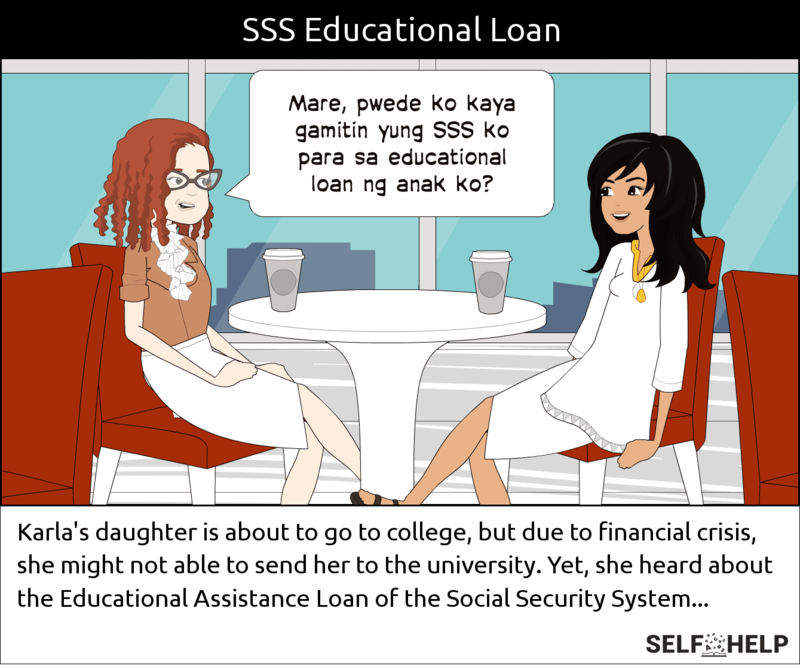 The SSS offers student loan for a four-year course or technical vocational. The member and or the beneficiary of the member can avail the privilege granted. Seems like your child’s life is all ready, from birth (availing the maternity benefit) and to sending him to school. You may download the educational assistance loan program form here, the form includes the terms and conditions, all the necessary info that you need to know. Oh, see. As what they claimed “sulit sa SSS”. They have this SSS Sulit Conference engaging those who are not yet a member to save up with them. Why not? It’s not bad at all. So now you have an idea where to save. You can have a bank saving or save for some security insurance. Or have it both though. Well, for some comments, to be honest, the service is not that so great satisfying. There are hassles on the system of transactions. Well but then it’s always a part of that. It’s not a matter of stew (nilaga). You’ll really go through fit in yourself in a crowd, slow lanes, demanding checklists of requirements, and a number of returns. Patience (pasensya) to you Juan. Junelyn Sarona is Self-Help's regular contributor! She finds writing as a great adventure and it is her passion. She joined Self-Help Pinoy Team because of her natural love to spread positivity to all Filipinos and Filipinos at heart.